It was the summer of 2009, our son was turning 2 and I found out I was expecting again. My husband and I were thrilled and our biggest concern at the time was making room for one more in our 2 bedroom townhome. Our excitement and nervousness doubled as we found out our new baby was two new babies- we were having twins. My doctor’s appointments and ultra sounds multiplied. At around 6 months of pregnancy, it seemed like the odds of an early birth were high, and I was placed on bed rest. It was a tough time as my husband had to travel for work and I had my active 2 year old to care for. My first son had been born after an emergency C-section, so it followed that my twins had to be delivered the same way. At 2am on February 15th, 2010 I started feeling contractions and knew it was time. I was just over 36 weeks along at the time. My mom had arrived already to help and my sister was planning to fly in as soon as the babies arrived- we needed all the help we could get! I lay in bed timing my contractions while searching for the best flight deals on my phone. By 4am we were on our way to the hospital in Boca Raton, and my sister was packing her things in Chicago. I was much calmer than I thought I would be. My babies were coming and we were as ready as could be. My ob arrived and everything happened so quickly. At 6.20am my identical twins were born, a minute apart. 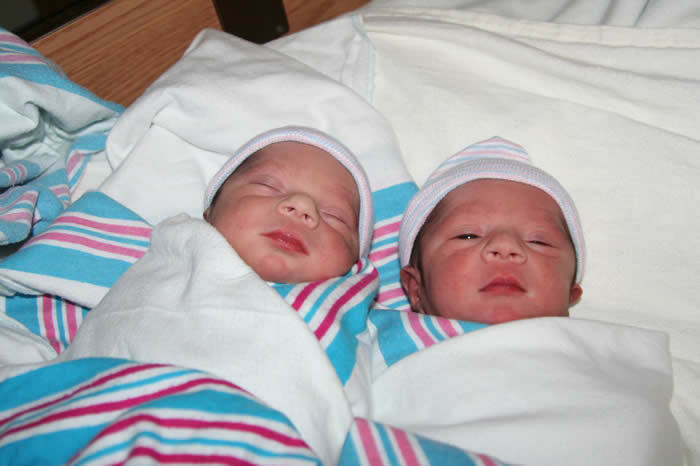 Two healthy boys weighing 6lbs04 and 6lbs 01. Rayan and Yosef. My husband was with me, and he was having a great time holding the boys and getting his picture taken with them while I was straining to get a good look. I remember thinking this was one of the happiest days of my life. Things changed. 6 hours in the room and they had yet to bring me my boys. I was worried about feeding them. What was taking so long? I was told that their blood sugar was high so they had been fed formula. They were currently under heat lamps. I was slightly annoyed as I had not wanted my babies to be fed formula. I was more anxious to get a chance to really meet and connect with the newest members of our family. They finally arrived in the room, bundled up and out cold. Not a peep. This was different. My first had been bright eyed and bushy tailed from the instant he was born. “Spirited little guy” the nurses had said. Everyone told me this is how newborns really are- mostly sleeping. My first born was the different one. Twins were not going to be as hard as I had imagined I thought to myself. The next day, after the twins had been whipped back to the nursery many times for low body temperature, I was starting to feel nervous. But they were twins after all, and born a little earlier than normal. One nurse told me to unwrap them and hold close to my body for warmth. Another yelled at me for doing just that. I was hardly able to feed them. Then to add to it, an ob arrived to circumcise them. We had requested this before their birth, but I felt they were not strong enough. She called me in my room and asserted that they will be fine, it wasn’t anything to worry about. I hadn’t felt this way for my first but with these two, I was uncomfortable. Still, I thought, the doctor knows what they are going through so if she thinks its OK, it should be fine. After I gave my OK, I cried. It’s my hormones, I told myself. Later that day, things started going wrong. Rayan was being checked into NICU. How can it be? I cried a lot. I had hardly spent any time with them. They were so healthy when they were born, how could this be possible? Shortly after I was told Yosef was following. It will only be for a couple of days the doc told us. They were just slightly premature. I was going to be leaving the next day- it meant I wouldn’t be able to take them home with me. I was a mess. We came back to visit the next day after discharge. The nicu had strict visiting hours. The twins had feeding tubes in and were hooked up to an IV. It was hard to see them lying so lifeless. The nurses kept asking me if I was sure I was 36 weeks when they were born. They seemed more premature- maybe I had the dates wrong, she suggested. It didn’t make sense. But it was OK; these were all typical signs premature babies had. On day 5, we were visiting our babies again. My phone was on silent while I was inside. We stepped outside to go home and my husband went to bring the car as I was still in pain from my surgery. I saw several missed calls from the same Miami number on my phone and many voicemail messages also. I started listening to the messages in order and suddenly the world stopped making sense. This woman was saying something about my twins having a medical problem. Who was she and why did someone in Miami know anything about my boys. What in the world was newborn screening? And then a message that she couldn’t find us so she was having police sent to our house. What? My husband pulled up and saw the look on my face. I was frantically dialing the Miami number. I spoke to the doctor who had been trying to reach me, and she sounded relieved to hear that the twins were in nicu. She hung up to stop the police from going to my house and called me back. Those minutes were gut wrenching. She called back and explained to me that my boys had tested positive for a metabolic disorder.What does that mean? And what could happen to them? She told me on the phone that my twins can go into a coma and die. She hung up to speak to the neonatologist and in a daze we re-parked the car and stumbled into the nicu. We were asked to sit in the conference room as we waited for the doctor to talk to us. Both my husband and I were feverishly looking up ‘metabolic disorders’ on our phones, tears streaming. Just 5 days after the best day of my life, came The Worst Day. I kept hearing the words in my head- ‘they can go into a coma and die’. I was picturing the crib in our room that the twins were to share, and all I could think was that it would stay empty. The doctor came in. He looked upset and he tried to explain to us what it all meant. They still didn’t know what kind of metabolic disorder. They wanted to move our babies to Miami, a.s.a.p. He said there was a chance that the test was a false positive. Their ammonia level had come back in the 100s- which he said wasn’t too high for children with metabolic disorders. We wanted to believe him….but how could they mess up 2 results? To put in perspective- normal ammonia levels are below 40. A result of 60 or higher can be dangerous. The next day, early morning on a Sunday, we received a call from the hospital that the helicopter was on its way to transport the boys. We rushed out to the hospital. Only one parent could ride with the babies, and that was to be me. They fit both babies in one incubator and wheeled them out. The nurses hugged me and told me they would pray for them as they handed me a box of tissues for the journey. My first helicopter ride- I had always wanted to see a city from above, but my eyes were on my treasures in the clear box, not the view outside. We arrived at Miami children’s hospital and a wheelchair was waiting for me as I could not have kept up in my post-surgical condition. We were wheeled to the nicu, where Dr. Parul Jayakar was waiting for me on a Sunday morning. Little did I know that was the least of her dedication- a specialist working on a Sunday morning. As the twins were taken inside, she started asking me a lot of questions about my pregnancy and also explaining to me what this was all about. And that began our journey as the parents of babies with a metabolic disorder. Our twins stayed in the NICU for 1 month and we would visit every day. During this time we found out that they had a type of organic acid disorder called Propionic acidemia (PA). There is currently no cure for PA. People with PA can never eat high protein foods such as meat, dairy, nuts, legumes/pulses, soy/tofu to name a few. A protein restricted diet is the main treatment, which is in the form of a special formula which has the correct amount of protein for their weight. A dietician develops this formula, based on body weight among other things. Protein is important for growth, and too little would not allow proper growth, while too much could be life threatening- so a delicate balance has to be reached. They also had several blood tests done to determine which formula recipe was working best for them. They were still having trouble eating by themselves so an ‘ng’ tube was inserted through the nose for feeding, and stayed in for most of the time they were in the hospital. Even after the ng tube was removed, they would take a very long time drinking just 1 ounce of formula. We were taught how to prepare their special formula by the dietician and also by the technician who made it in the formula room. The boys would need this formula for life, adjusted in quantity and composition based on their weight and also by the results of regular blood tests in future. Other than the formula, their treatment included giving them calories at frequent intervals-carbs and sugar would give them the energy that regular kids get from protein. Not being able to eat certain things is not their biggest problem however. Over time toxins build up in their body and affect major organs like their liver, kidneys, heart and brain. Finally, we were able to take our babies home. They had heart monitors that came with them, which were to be connected at night. We stuck to the hospital routine of feeding them every 3 hours on the dot. They were never hungry and would never cry to be fed so during the night we had to set alarms for every three hours. It would take an hour to feed each baby, so those were very tough days. My older son was 2.5 and we didn’t want to send him to school in case he brought home a virus, so I took care of him also. My mother stayed for 3 months to help out, which was a blessing. My sister used up all her vacation for the year before returning, at which point my sister in law arrived to help. We didn’t go out anywhere, nor did we let anyone come and visit for several months to keep the twins from getting sick. We also pushed back their vaccines as we weren’t sure how their fragile bodies would react, especially if they were to have a fever. My older son had turned 3 years old and we started sending him to school part-time. It was nice for him to get out of the house and play with friends his age. However, he did start getting sick a lot. And every time he got a cold, the twins would catch it also- only theirs lasted longer and they got much sicker. We made it through their first fevers and breathed a sigh of relief. However, little did we know what 2011 would bring. 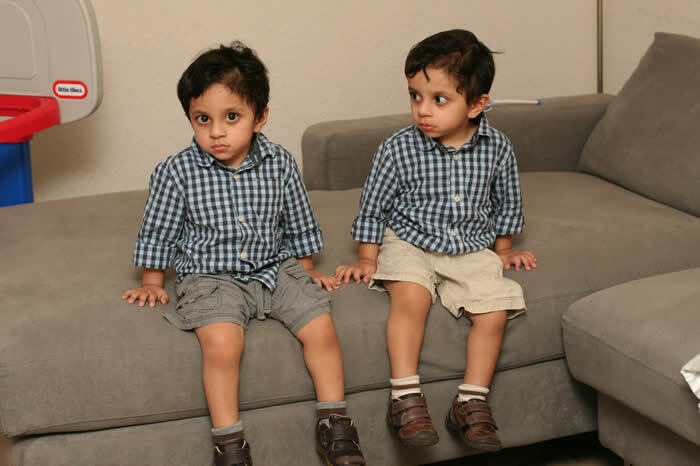 January 2011- Yosef and Rayan were extremely sick with a cold and it progressed to bronchiolitis. We were able to avoid hospitalization but they were given a nebulizer and required regular breathing treatments to get better. Feb- Another cold. Yosef developed pneumonia and was admitted to ICU. Rayan was kept overnight with an IV for observation. They were in the hospital for their first birthday. March- Yosef had his first crisis and was in ICU for several days, following a second helicopter ride. He had a catscan done to check for brain swelling. April- Stomach virus got the best of our whole family. Trip to ER. May- Yosef was back in the ER after falling off the couch and fracturing his wrist. June- All kids severely sick with congestion and ear infections. Many trips to ER. Yosef had high ammonia but continued eating fine. July- Rayan admitted in hospital for constipation. August- Yosef hospitalized for not eating and going into crisis. September- Yosef in hospital for Gtube surgery. October- finally a month where everyone was fine. November- Rayan hospitalized for constipation. December- Rayan in hospital for constipation again- this time he ended up with g-tube surgery and being in hospital for 10 days. Every trip to the hospital has a devastating effect on our family. There is the stress, the reality of the disorder- we may lose one or both of our kids, as well as the upheaval of daily life. Through every hospital stay, and even the ER trips, our metabolic specialist Dr. Jayakar was our pillar of strength. She came to see us at the hospital every day, called several times and constantly emailed, not to mention reassure us. During one hospitalization she was out of the country but I still received emails from her around the clock and she was in constant touch with the medical team. Finally, after the gtubes were put in, we breathed a sigh of relief. A gtube is basically a piece of plastic inserted through the abdomen into the stomach and allows passage of fluids into the stomach through a tube directly into the stomach. This really cut down on our hospital trips as we could much more easily control their calorie intake, their hydration, as well as the constipation problems. There was more freedom of going out as a family without worrying that they may fall asleep without drinking their formula. When they had colds and couldn’t drink due to stuffy noses, it was OK.
We started 2012 with a positive outlook. Our twins had just started to walk, at 22 months of age. Despite going through everything they went through, they were so strong, and such happy babies. Then in late January, we discovered something else. They had an abnormal EEG and could be having silent seizures. In February, they were hospitalized for 2 days to do a video EEG and try to determine if they were indeed having seizures. In a period of 24 hours, both had 2 seizures each. They were placed on seizure medication and thankfully, their seizures have stopped, confirmed by normal EEGs in April. By the time Yosef and Rayan were 2.5 years old, they could regularly go to a public playground and their immune system is holding up (knock on wood!). Of course, we use a lot of hand sanitizer every time we go anywhere. When we arrive home they also run to the bathroom door (safety locked from outside) and say “open! Hands!” and step up onto their step stools by themselves to wash their hands. They are getting better at climbing up stairs with assistance- and pros at going down a slide! We had been more worried about Yosef as he is a little more behind cognitively than his brother, and not very social. However, since starting the seizure medication he has come a long way. He is making good eye contact and his vocabulary is increasing. He loves numbers and rocket ships. One day at a grocery store aisle he pointed to the number above and correctly said ‘eight’. The lady behind us then pointed to the aisle number next to us and asked him what that said- and he told her: “seben”. How proud was I that day! Not because he knew the numbers, which I knew he did, but because he had a ‘conversation’ with a stranger. ​They are extremely opposite in personality and Rayan will pull our neighbors into the house from the door saying ‘come on!’ while Yosef will push them back towards the door saying ‘bye!’. I think having speech and physical therapy from such an early age has helped tremendously. We still have many eating issues with solids but they love certain fruit, can eat baby food without trouble, and drink most of their formula by mouth. We feel very blessed to have come so far. I often think about their lifeless bodies at birth, hooked up to tubes. Then I see my 2 year old Rayan, as he runs up to me, hugs me and says “mama! I yuv you!”and Yosef says “hug!” and wraps his arms around me and every moment becomes worth it. There is no profession of love more honest and sincere than that, and validates that all of our effort is not in vain. It is very difficult to be part mom, part doctor, part nurse on a daily basis. More difficult to watch your children suffer and not be able to do anything about it. Taking the twins to have their blood drawn, sometimes on my own, leaving one sobbing baby in the stroller as I help to hold the other hysterical one, while the nurse tries once, then twice or more (11 times once), to find that vein. Remembering the different medications at the right times each gets daily, forever. Making sure they are fed frequently by mouth or otherwise. Scheduling appointments with multiple specialists and ordering medications and formula on time. Fighting with insurance companies. Making sure they get their physical therapy, speech therapy, feeding therapy, and occupational therapy regularly. And not going places or having much of a social life to keep them safe. Mostly, it is difficult not knowing what is in store for them, having experienced so many unexpected events already. Still, despite the difficulties, I have to maintain that I am extremely lucky. I am lucky to be loved by so many- a wonderful family, and wonderful friends. I have three beautiful boys who are perfect in my eyes. And I am lucky to have my husband, my best friend, the man who shares all this with me always with a smile on his face. Currently there is research going on to find a cure for Propionic academia. They have been able to cure this disorder in mice but it is still far from a cure for humans. Any donations to the Propionic Acidemia Foundation or to the Organic Acidemia Association are appreciated and will help further the research. However, the most valuable contribution we have had is that of prayers from all of our friends and family. Thank you all so much for the prayers- all the people we know from around the world and every different religion- all those prayers have been what has kept us going. All the love and support we have received from our family and friends is such a blessing. My parents, my siblings, my in laws, the family members who have come all the way especially to help during tough times, the phone calls the messages, our friends and neighbors who went out of their way to help by cooking meals for us, picking up my son from school and babysitting, so many little things that are huge to us. My message with sharing our story is simply to be thankful and appreciate what we have. A friend of mine told me that everyone has a difficult situation in their lives at some point, and at least from looking at the people close to me, it is so true. We all have our hurdles, but hope and prayers keeps us going. This is a difficult journey, and the future is scary sometimes, but if we continue to have more good days than bad, life is great.